EDINBURG — County leaders gave the new courthouse project legs to stand Tuesday with the tentative approval of an agreement with the proposed builder of the new building. The final agreement between Hidalgo County and Morganti Group Inc. is pending legal review, but a majority of the terms have already been set and defined in a draft document of at least 225 pages. Morganti agreed to earn a 2.2 percent fee of the construction cost, which falls below the industry standard of about 4 percent. The county also approved to pay a little more than $500,000 in pre-construction fees, and any additional work will earn Morganti a 3 percent fee. Morganti had initially proposed a 4 percent fee for work performed outside of the scope of the project, but Precinct 2 Commissioner Eddie Cantu was able to negotiate that down to 3 percent. “We have a fee that is competitive,” Cantu said Monday. Cantu, who led negotiations with Morganti, will likely continue to have an active role in determining the course of the project after being re-elected to a second term earlier this month. With Hidalgo County Judge Ramon Garcia stepping down, and Precinct 4 Commissioner Joseph Palacios being unseated, Cantu is poised to have the loudest voice on the Commissioners Court. Precinct 3 Commissioner Joe Flores has been in office longer than Cantu, but often takes a back seat, while Precinct 1 Commissioner David Fuentes is the newest member of the court, currently serving his second year of office. If all goes as expected, Morganti will help whittle down the estimated cost of the project to a guaranteed maximum price. When the company first submitted its proposal in February, it estimated the cost of construction at about $101 million. That figure, however, is now at $127 million based on estimates by HDR, the project’s architect. Garcia questioned the price difference between HDR’s estimate and Morganti’s during a workshop Monday. But senior project manager Brian McIntyre, of Jacobs, indicated it stemmed from a lack of information on Morganti’s part when the proposal was first submitted. That estimate was based on 10 to 12 renderings that were available at the time. “There is much more information available now,” McIntyre told Garcia. 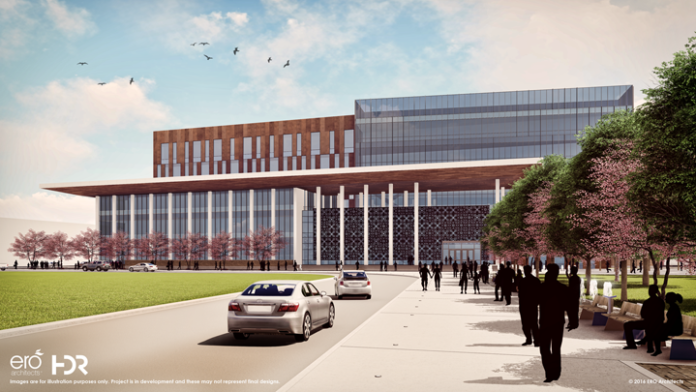 The selection of the builder cements the progress of the project as representatives from Morganti, HDR and Jacobs all work together to finalize the schematic design before breaking ground on the facility.